Though by no means required, it’s totally normal to want to look a little dolled up when you go on a date, to a bar, to work, to the post office, wherever. I personally choose to wear makeup in most of these contexts (but certainly not all) because I feel like a pasty teenager without it. But the thing about makeup is...it comes off. I don’t care how long lasting a product claims to be, by about 2 p.m. on any given day, I’ve usually managed to smear, sweat, or rub it off. That’s fine if I’m just going home after work, but it’s less fine if I have things to do that I’d like to be wearing makeup for. I used to carry my whole huge makeup bag around with me, which was annoying and also heavy, to ensure that I was prepared for any situation that I might want makeup for — like say, if I witness a crime and a news crew asks to interview me about it on camera, or that Humans of New York guy (is he still around?) insists on photographing me being casual on a park bench, or some dating app dude asks me out for a drink that same night and I don’t have time to go home first. 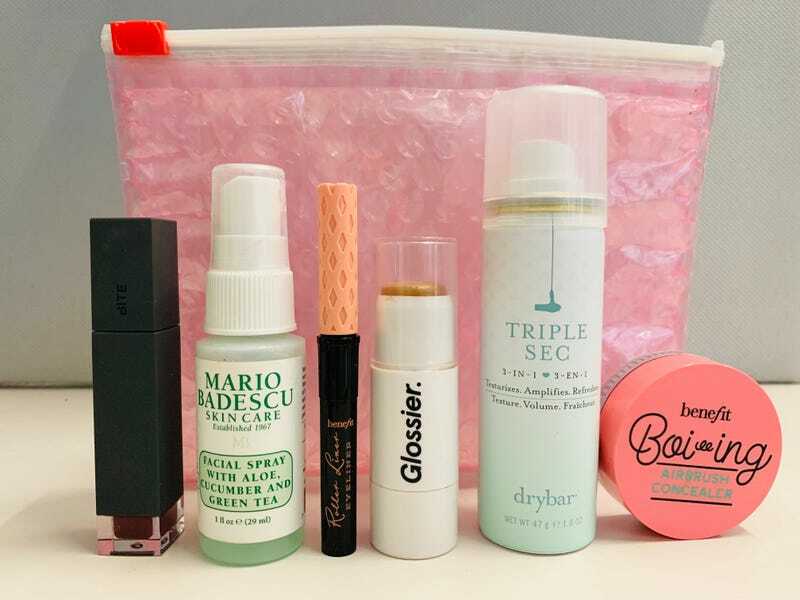 After a while, though, I just couldn’t take the uncertainty of never knowing whether my products were in my bag or in my bathroom, nor could I justify all the space they took up in my purse. So I compiled a much smaller pouch filled with mini must-haves specifically meant for quick touchups (I mean, it’s not like I was going to dab on foundation from a full-size bottle while out and about, anyway). Even if I don’t use this stuff every day, I feel better knowing it’s there if I need it, and with the largest of the items clocking in at under 5 ounces, making these little guys my permanent tote bag companions has been no trouble at all. Plus, they’re small and adorable! I’ve you’ve ever been torn between the sweet relief of splashing some water on your face and the utter anguish of ruining your makeup, you should be misting. A good mist, like this Mario Badescu Skin Care Facial Spray, will be hydrating without causing your mascara to melt down your cheeks. I’ll spritz it on my face at random moments through the day when my skin feels dry, or at the end of a makeup touchup to make sure everything’s set. A good concealer is hard to find, but I’ve been Benefit’s Boi-ing line for years — mainly because you’re meant to put it on with your fingers and I’m lazy. That makes it perfect for on-the-go touchups though, since I have no desire to carry around brushes all day. This Airbrush Concealer blends nicely and delivers some pretty solid coverage. If I were doing my makeup in the morning, I’d probably pat it on, then dust a powder foundation over it, but if I’m out, honestly, I don’t bother with the second part. Normally, I’m big into chapstick, but I’ve recently come to realize being an adult woman means that sometimes you want to wear adult lipstick — sort of. I’m not sure if I’ll ever regularly use one of those twist-up tubes, but this liquid lipstick from Bite Beauty reminds me of the lip gloss I used to like when I was in middle school, except it packs a punch in the pigment department. Plus, it’s really moisturizing, unlike those other liquid lipsticks that make your lips feel like they’ve been shrink wrapped. Bonus: It’s half off at Sephora right now. I first saw this baby eyeliner from Benefit in the “impulse buy” area near the Sephora checkout line, and it worked. I impulse bought. It was just so cute! Luckily, this little liner has come in pretty handy. The size makes it a little awkward to hold at first but unobtrusive to carry around, and its felt tip creates a smooth line every time. Everyone’s hair needs are different, but I’ve found that this texturizing spray from Drybar works on pretty much any hair type. Just spray it on, then tousle your hair a bit for an instant volume boost and a sort of purposefully messy look (my signature). Another thing about this product: It has a very strong scent. Like so strong, that I’m usually inclined to wash my hair soon after using it — that’s actually fine though, since I’d probably only use it on second or third day hair anyway. The smell is by no means bad, just sort of vanilla-y, so I like to think that the spray doubles as a perfume. I’d venture to say that Glossier’s Haloscope is a cult-favorite at this point, and for good reason. This moisturizing highlighter stick glides right on your cheekbones to create a subtle shimmery glow that easy to apply on the go. In fact, I like it so much, I’ll usually smudge a bit on my eyelids, too. The bronzed Topaz hue is my personal favorite, but the pinkish Quartz and opalescent Moonstone are equally pretty shades. If you order Haloscope — or any other Glossier product — Glossier will ship it to you in one of these resealable pink bubble-wrap pouches. I have many, many pink bubble-wrap pouches, and I love them all very deeply. I use one of them to hold all my mini beauty products, and the rest for all my other junk, including snacks. If you’d rather not go all in on Glossier, this makeup bag from Urban Outfitters will do the trick, too. I prefer a cosmetic case that’s transparent, so you can see what’s inside, and this PVC material is sturdy enough to carry all your valuable products and easy to wipe down in case of a leak. If pink’s not your thing, I get it; this bag comes in five other fun colors.